You have probably heard me say several times “A woman’s bag is the final touch, it shows her personality and where she is going”. But what INSIDE her bag really shows who she is (and what she can live without). There’s the minimalistic girl that only carries her ID, credit card, and phone… and there’s the Mary Poppins girl that has everything you need; umbrella? hand lotion? snacks? pills for headaches? She has it. Wallet: with my ID, credit cards, business cards, and emergency cash. You know, the basics. Extra phone battery/Phone Charger: I don’t know why but my cell-phone battery drains very quickly…I blame Snapchat (Follow me there as danidaniramirez!). Gum or Mints: Hi, my name is Daniela and I’m addicted to gum. Lipstick (either red or burgundy): it’s the best way to change your look from day to night or to look dressier in a heartbeat. Chapstick: my lips are very dry and if I’m not moisturizing it at least twice a day, they get chapped. I’ve been using Burt's & Bees...it's super moisturizing and the one I like has a nice red tint. Powder/Blush: just in case I get a little shiny or need a quick touch-up. Sunglasses and eyeglasses: to hide my dark circles and protect them from the sun…and well, my eyeglasses because I can’t see anything from a distance. Snacks: apples or bananas are my favorite to carry around. UbyKotex : I’m very regular but I would always get my period and freak out because I wasn’t prepared. I’ve learned to always carry tampons with me…and now I feel like a “savior” when someone asks “Do you have a tampon?” (hey let's #SaveTheUndies). I’ve been using UbyKotex for a few years now, and it's a must-have in my everyday bag. 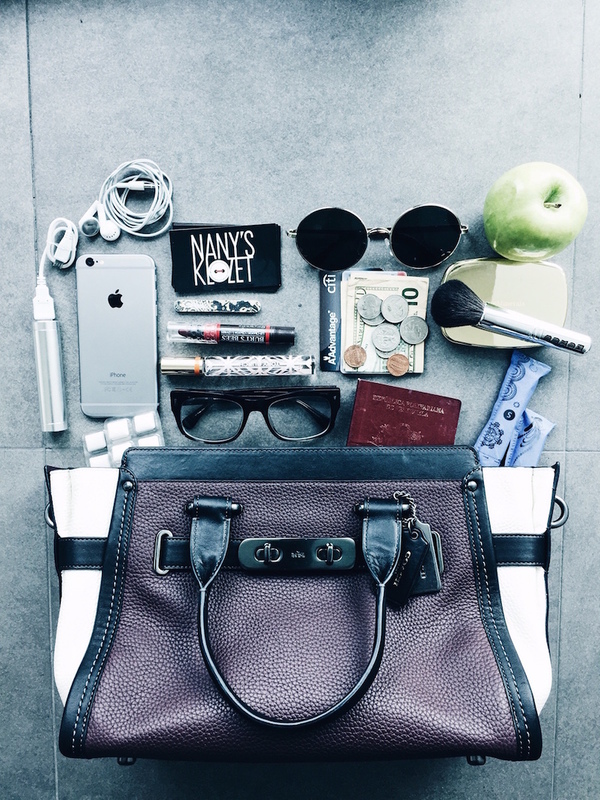 What do you carry in your handbag? What are your must-haves? Let me know in the comments. Post Sponsored by Lunchbox. All Opinions are 100% my own. Extra phone battery is very necessary!! !